The class on the last day before Spring Break is a planning challenge. A test keeps students working until the end. Videos mean a teacher does not have to try to engage students who are so ready to begin break they cannot focus; they can be left alone and ignored. Games can be fun but seem to give students a reason to take the activity less seriously. 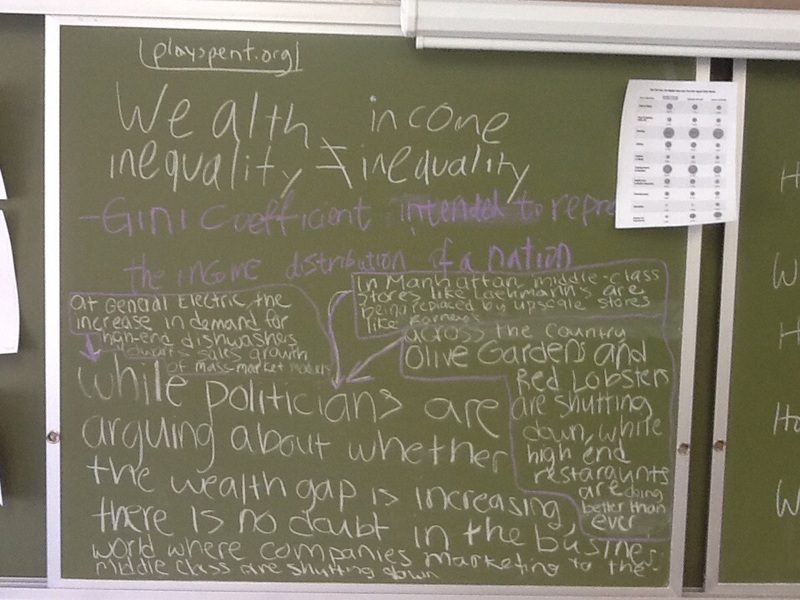 Today, I decided to have my US history classes, in the midst of a unit on Economics and Social Class, investigate the following questions: Are we in a new Gilded Age? If so, should we be worried about it? At first glance and after a quick Google search, those questions appear simple: yes, and yes. Done. But I told my students that they needed to understand the economic dynamics more deeply and know the implications for social class. 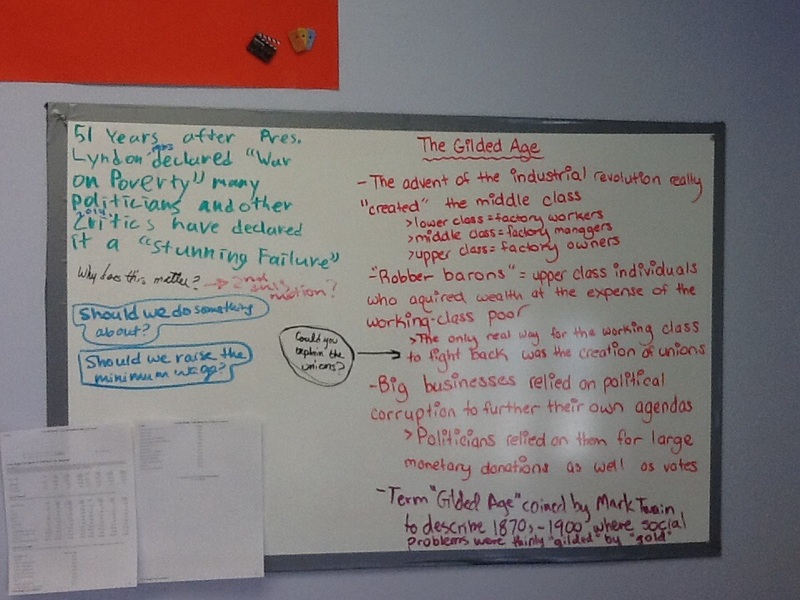 I have two US history sections, so we are doing a “Tag – you’re it” model. 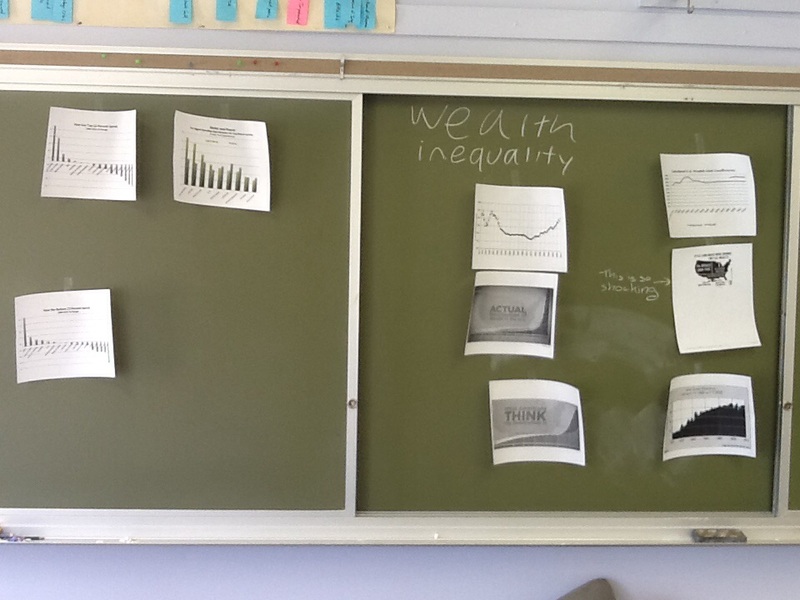 My first class began the inquiry and posted their notes and printed diagrams/charts around the room. My next section will come in, read the notes, look at and digest the data, and then see how they can go further to expand and deepen the inquiry. I will save the notes over the break. Then, each section will have one more class to contribute to the notes. Finally, I will have them write their answers to my original questions. I told the students that I didn’t want them buried in their devices silently doing research. It was to be an interactive class where students would find information, ask questions, discuss, and write notes for others to see. At first, they were a little skeptical that I was asking them to put forth such an effort on the Friday that break is starting. But once we got started, it worked really well. There were informal conversations about income, wealth, how people spend their money, cost of college, and economic trends. My boards are full of notes and charts. 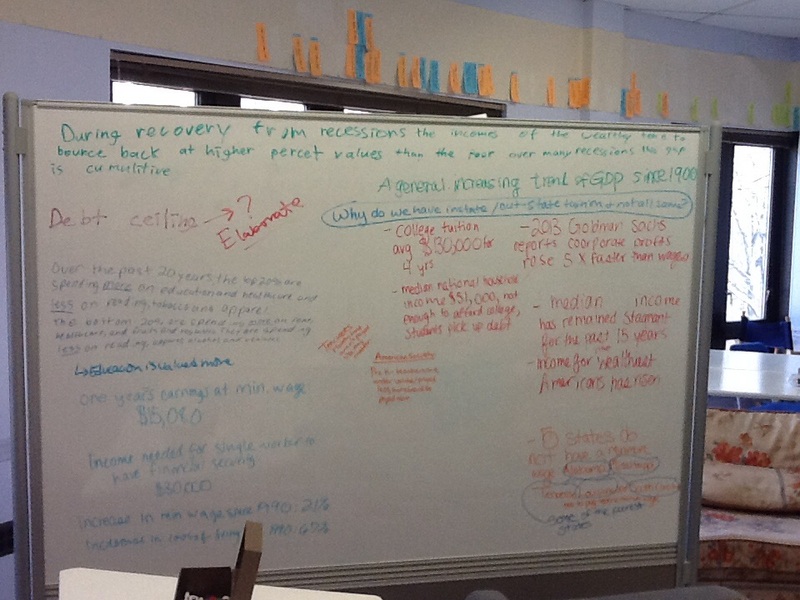 Students got up, sat down, moved in and out of conversations, wrote notes and posted data. The atmosphere was relaxed, and students were thoughtful. The second class engaged with the notes from the first, added questions and information. They became engaged with the question of minimum wage, in particular, playing an online game where you have to live on minimum wage. What sold this lesson plan on a day when students have a strong tendency to be tired and easily distracted was the relevance and important they saw in it. They hear the headlines and the sound bites, but they want to understand the issues. A thematic history class has opened up more opportunties like this. 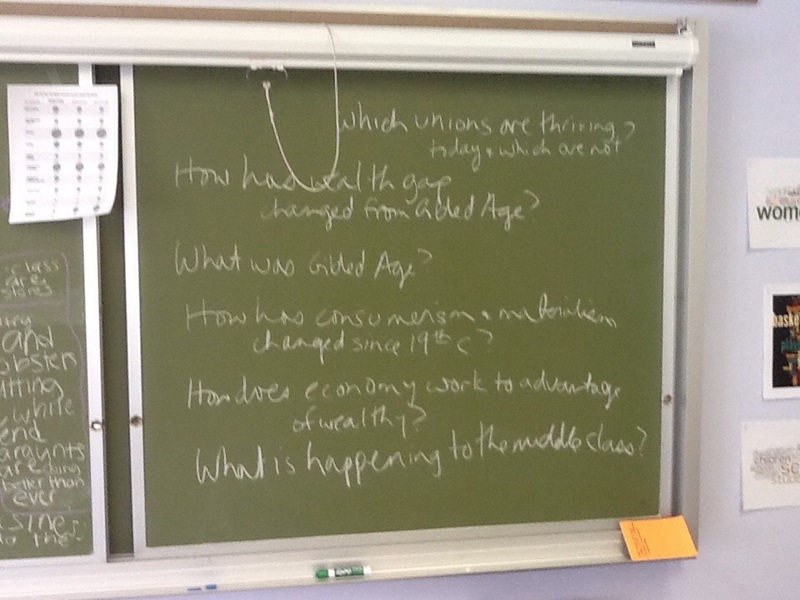 We are simultaenously learning about the economy of the late 19th century and today. 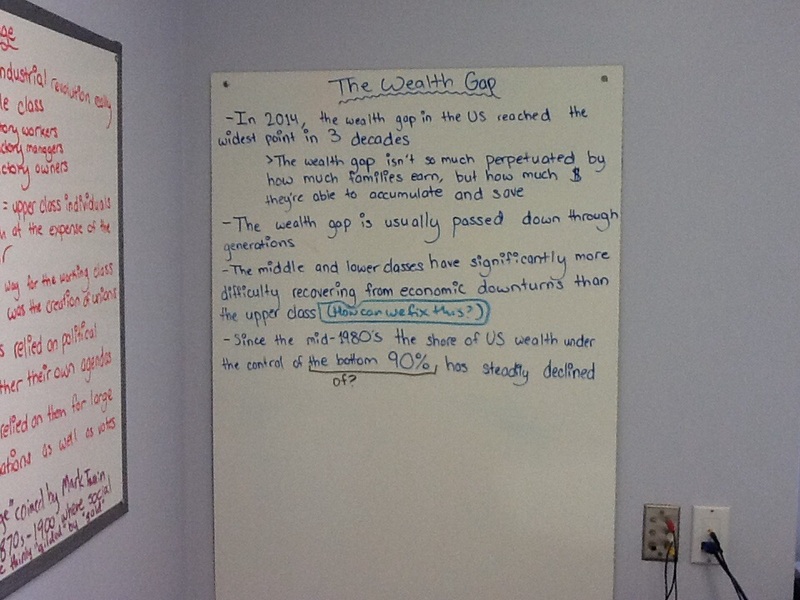 Students are very interested in the way the economy works and doesn’t work, as well as how it has changed over time. They have learned US history before but not through this particular lens.